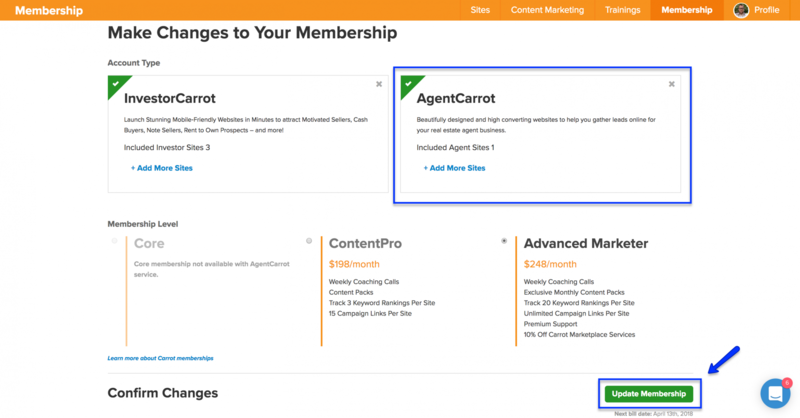 This tutorial will walk you through how to add AgentCarrot to your Carrot account! Head over to your account page, then in the header, click on Membership. On this screen, you’ll want to select “Update Membership” under Membership Details. If you also need to update your Credit Card information, click here. In the box that says “Unlock AgentCarrot Today!” click Add To My Account. Here you can see that AgentCarrot has been successfully added to your account because it is no longer grayed out. Just make sure to click Update Membership at the bottom of your screen to save your changes!